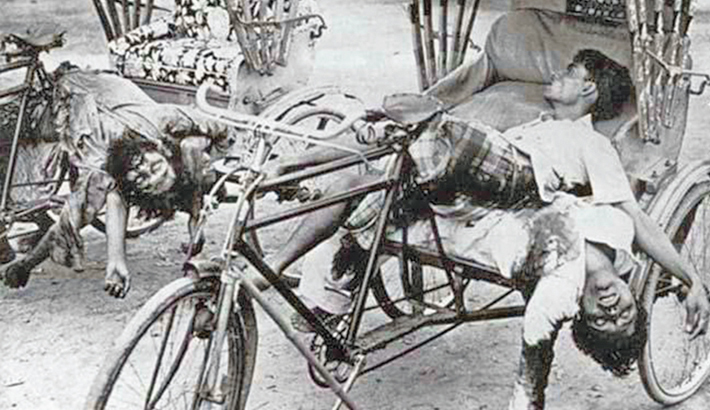 Bodies of Bangalee victims lie scattered in Dhaka after the massacre unleashed by the Pakistan army on the Black Night of March 25 in 1971 (file photo). The nation will observe Genocide Day today, commemorating the barbaric mass killing by Pakistani occupation forces on March 25 in 1971. The government has been carrying out efforts to earn international recognition in observing the day worldwide, recalling the barbaric crackdown by the Pakistan-led occupation forces in a planned manner under Operation Searchlight. Visiting United Nations under-secretary general and special adviser on prevention of genocide Adama Dieng on Sunday said the UN would raise the 1971 issue of Pakistani genocide in Bangladesh in the international forum despite opposition from some countries. “Though some countries may oppose it, we will raise the issue of Pakistani genocide in Bangladesh during the Liberation War in the international forum,” he said during a courtesy call on with Prime Minister Sheikh Hasina at her office in the capital. On the black night of March 25 in 1971, the Pakistani military junta resorted to the mass killing in Dhaka to implement their blueprint to thwart the Awami League’s assumption of office following the election mandate of 1970. The day is going to be observed officially for the third time in the country as parliament on March 11 in 2017 unanimously adopted a resolution to observe March 25 as the Mass Killing Day. Describing Pakistanis attack on various parts of the country, rights group say that the coward Pakistanis staged deliberate killing of the Bengalis and set villages on fire. Many also heard whole-night shooting from Pilkhana, they recalled. Media across the globe published the news terming the incident as genocide while more pieces of information are still available across the globe. Liberation War affairs minister AKM Mozammel Haque on Sunday blamed Bangladeshi diplomats posted at United Nations for making mistakes in portraying the killings to the outside world. Expressing frustration, he said when the UN decided to observe International Genocide Day in 2015, the diplomats failed to portray March 25 mass killing rightly. They killed people indiscriminately, set fire to houses and property and looted business establishments, leaving a trail of destruction. President Abdul Hamid and Prime Minister Sheikh Hasina issued separate messages on the occasion of Genocide Day. In her message, Sheikh Hasina said the then Pakistani President Yahya Khan had assembled troops in the East Pakistan and left for Pakistan secretly on March 25, 1971 after giving order for carrying out genocide in the name of ‘Operation Searchlight’. Marking the day, the country is set to stage a one-minute blackout from 9:00pm to 9:01 pm today, recalling the horror of the March 25, 1971 black night when the Pakistanis launched attacked on unarmed sleeping Bengalis. The Forum for Secular Bangladesh will bring out a torch procession from the central Shaheed Minar premises at 8:00 pm today. Discussions and memorial programmes will be arranged at the all educational institutions. Rare photos and documentaries on mass killing will be exhibited on the premises of the Department of Films and Publications to be arranged jointly by Information Ministry, Press and Information Department, Bangladesh Television and Bangladesh Betar. Different political and socio-cultural organisations have also chalked out elaborate programmes to mark the day. Dhaka University has decided to observe Genocide Day in a befitting manner. As part of the programmes, a photography exhibition will be held at 4:01pm, reminding the atrocities committed on March 25, 1971. The programmes of lighting candle at 9:01pm, screening of a documentary and a discussion will also be held in the evening.